Begins at Broad and Locust Sts., and runs South on Broad to Lombard St. The Arts and Entertainment center of the city, Avenue of the Arts boasts venues, restaurants, and much more. Vine St to the North, Arch St. to the South, Broad St. to the West, and 8th St. to the East. The Chinatown Friendship Gate is internationally known landmar, and is located at 10th and Arch Street. Chinatown also boasts an array of culinary attractions. Bounded on the East by 23rd St., on the West by 24th St., on the North by Panama St., and on the South by Pine St. This neighborhood is mostly residential, and within short walking distant of commercial areas. Lies North of Market St., South of Spring Garden St., West of Broad St., and east of the Schuylkill River. Logan Square contains Franklintown, Penn Center, and most of Philadelphia’s Business District. It is one of the five parks central to William Penn’s design or Philadelphia and is named after an eighteenth century mayor of Philadelphia, James Logan. On Sansom St. between 7th and 8th Sts., and on 8th St. between Chestnut and Walnut Sts. This is the oldest diamond district in America and second in size. Most of the businesses within this area have been owned by the same families for centuries. 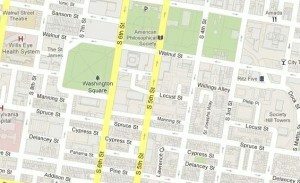 Corresponds to the area along Market St. between Arch St. to the North, Chestnut St. to the South, Juniper St. to the West, and 6th St. to the East. This area serves as a major retail center within Philadelphia. It also boasts the Pennsylvania Convention Center. Area between Front and 6th Sts., with Vine St. to the North and Walnut St. to the South. This area is one of the city’s most popular spots for nightlife because of the number of bars, lounges, and clubs. There are First Friday events, many galleries, and a variety of restaurants throughout the small area. Comprised of the Benjamin Franklin Parkway. Waterfront area of Center City along the Delaware River section of Philadelphia. It is named this because William Penn, the founder of Philadelphia, docked near here when he arrived. Area from 18th St. to the East, Walnut St. to the North, Rittenhouse Square West, and Rittenhouse Square South. This area is one of the five original parks that William Penn based the city plan on. It was renamed in 1825 after David Rittenhouse. North to Walnut St., South to Lombard St., East to Front St., and West to 8th St. This is a charming part of Philadelphia that features cobblestone streets and gorgeous rowhomes. Along South St. from Front St. in the East to 7th St. in the West. This area is one og Philadelphi’a largest tourist attractions because there is a fun atmosphere, with diverse shops, bars, and restaurants. North to Market St., South to South St., East to 7th St., and West to Broad St. This is considered to be a very trendy neighborhoods that offers a lot of coffee houses, restaurants, and smaller end boutiques. North to South St., South to Washington Ave., West to 11th St., East to 6th St. This was the first neighborhood where Italiam immigrants settled in Philadelphia. There are many art and cultural events in this area. North to Gray’s Ferry Ave., South to Passyunk Ave., West to Schuylkill River, East to 24th Street. Along 9th St. from Fitzwater St. in the the north to Wharton St. in the South. This area features many markets, cafes, bakeries, butcher shops, etc., that are marked with an Italian influence. Washington Ave. to Passyunk Ave., and Broad St. to 18th St.
Washington Ave. to tasker St., and 6th St. to Broad St. This area is best known for its shopping and restaurants along Passyunk Avenue. It features Geno’s Steaks and Pat’s Steaks, feuding cheese steak businesses. Generally bound by 25 St. to the West, Washington Ave. to the nmorth, Broad St. to the east, and Mifflin St. to the South. North to Lombard St., South to Washington Ave., East to the Delaware River, and West to 6th St.
Queen village has many historic structures within its boundaries. Currently, Queen Village is home to nearly 7,000 residents. a.k.a Graduate Hospital and Southwest Center City, part of the 19146 postal code, West of Broad St as far as 25th St., Washington Ave. to South St. This area is currently experiencing a period of gentrification. It is frequently referred to as Graduate Hospital because of the medical center on the Northern edge of the neighborhood. To the North is West Philadelphia, to the South is Kingsessing, to the East is Cedar Park, and to the West is Cobbs Creek. Bounded by Cobbs Creek and 60th St. to the Southwest, Woodland Ave, to the Southeast, 53rd St. to the Northeast, and Baltimore Ave. to the Northwest. Southwesternmost neighborhood in the city; borders Philadelphia International Airport and the city line with Delaware County at Cobbs Creek and Darby Creek. a.k.a Elmwood. Borders with Delaware County at Cobbs Creek and extends to the Schuylkill River, Eastwick border it to the Southwest and Kingsessing on the Northeast. North to City Ave., South to Fairmount Park, Bala Golf Club is to the West, and Belmont Ave. is to the East. Lansdowne Ave. to the North, West Girard Ave. to the South, North 63rd St. to the West, and North 52nd St. to the East. Bound by Market St. to the North, Baltimore Ave. to the South, 52nd St. to the East, and Cobbs Creek to the West. Bound by Spring Garden St. to the North, 40th St. to the East, 31st St. to the West, and Mantua Ave. to the South. North 63rd St. to the West, Lansdowne Ave., to the South, and the SEPTA regional rail tracks to the Northeast. Overbrook is composed of four neighborhoods; Overbrook, Overbrook Farms, Morris Park, and Overbrook Park. This area is primarily residential. The predominant real estate is rowhouses, but there are a good number of twin houses as well. Schuylkill River to the East, Spring Garden St., Powelton Ave., and Market St. to the North, 52nd St. to the West, and Woodland Ave., University Ave., and Civic Center Boulevard to the South. Within its boundaries are the neighborhoods Cedar Park, Garden Court, Spruce Hill, Squirel Hill, Powelton Village, Walnut Hill, and Woodland Terrace. This area boasts the University of Pennsylvania, Drexel University, and the University of the Sciences of Pennsylvaia. The Eastern side of this area is comprised of these institutions, scientific research centers, and 30th Street Station. The Western side is mostly residential. East to 53rd St. and Fairmount Park, West to 59th St., North to City Ave., and South to Fairmount Park. Wynnefield is the home of St. Joseph’s University. On the Northwest by Northwestern Ave., on the West by Wissahickon Gorge, on the Northeast by Stenton Ave., and on the Southeast by the Cresheim Valley. This area contains Chestnut Hill College and many private schools including Chestnut Hill Academy and Springside School. The boundaries of Germantown are Wissahickon Ave., Roberts Ave., Wister St., Stenton Ave. and Washington Lane. This area is rich in history, with sites and buildings from the colonial era, some of which are open to the public. Located adjacted to Roxborough, Manayunk, Germantown, and Fairmount Park. 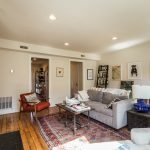 It runs along a stretch of Ridge Ave., along the banks of Schuylkill River, and extends northeast to Wissahickon Ave.
East Falls is desirable for its central location, a quick trip to center city or the suburbs. There is constant development of housing and retail areas, and a good number of restaurants and bars. Recently, this area has been gentrified, with Main St. boasting tons of restaurants, galleries, and stores. Also, the nightlife draws visitors from all over the area. Bordered to the Southwest by Manayunk, along the Northeast by the Wissahickon Creek, and to the Southeast by East Falls. Roxborough is comprised of both commercial and residential areas. Like East Falls and its surrounding neighborhoods, it is a short distance from center city, and is a very popular suburb. Bounded in the Northeast by Stenton Ave., the Southeast by Washington Ln., in the Southwest by Germantown Ave., and the Northwest by Cresheim Valley Dr. Approximate boundaries run between the Eastern bank of the Schuylkill River and 25th St., Cecil B. Moore Ave. to the North and Parrish St. to the South. This area is mostly residential with a commercial section along Girard Ave. This is considered to be neighborhood that is on the rise. Bounded to the North by Girard Ave., the South to Vine St., East to Broad St., and West to the Schuylkill River. This area is sometimes referred to as the “Art Museum Area” because of its close proximity to the Philadelphia Art Museum. Bounded to the North by Girard Ave., to the South by Spring Garden St., to the East by the Delaware River, and to the West by 6th St. This area has experienced a recent transformation, with housing and revitalization projects being taken on. The neighborhoods close proximity to center city has made it an extremely attractive area. This area is loosely based around Temple University’s main campus. It has experiences a major influx or housing projects because of the large number of students in the surrounding area. 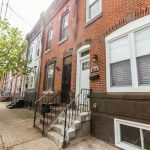 Located immediately Northeast to center city, its borders are defined as the triangle created by the Delaware River, Frankford Ave., and York St.
Fishtown, the home of JG Real Estate, LLC., has taken on a huge boom in the real estate business. Also, shops, restaurants, and other businesses have begun to sprout up on Girard Ave. 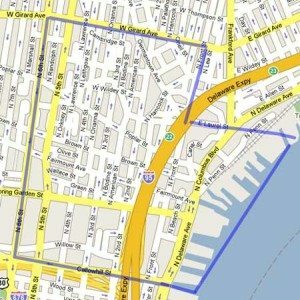 Boundaries are the triangle made by Erie Ave., Front St., and Trenton Ave.
Bounded by the Frankford Creek on the North, Lehigh Ave. on the South, I-95 and the Delaware River to the East, and the railroad along Trenton Ave./Martha St. to the West.